AP Village Revenue Assistants Salary Enhanced GO 30, 377 -VRA's Honorarium Increased Order : AP Village Revenue Assistants (VRAs) Salary Enhancement of honorarium from Rs.6000 to Rs.10,500 as per G.o.No:303. ఆంధ్రప్రదేశ్ విలేజ్ రెవెన్యూ అసిస్టెంట్స్ (VRAs) గౌరవ వేతనం రూ .6000 నుంచి రూ .10,500 వరకు పెరిగింది. 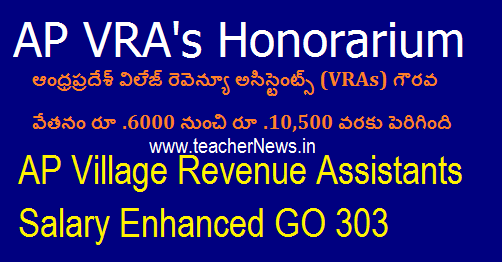 AP Government Enhancement of honorarium from Rs.6000/- to Rs.10,500/- per month to VRAs GO.No.303. The Village Revenue Assistants Honorarium enhanced from Rs.6000/- to Rs.10,500/-(Rupees ten thousand five hundred only) per month w.e.f.02.06.2018. AP Revenue Department – Village Administration – Enhancement of honorarium from Rs.6000/- to Rs.10,500/- per month to Village Revenue Assistants - Orders –Issued.G.O.MS.No. 303 Dated: 11-06-2018. In references 3rd to 5th read above, certain Associations have requested to enhance the honorarium to the Village Revenue Assistants due to raising prices of essential commodities and other necessities. In the reference 6th read above, the Chief Commissioner of Land Administration & Special Chief Secretary, AP., Vijayawada has submitted necessary proposals to Government to issue necessary orders in the matter. Government after careful examination of the matter, hereby order that the honorarium of the Village Revenue Assistants is enhanced from Rs.6000/- to Rs.10,500/-(Rupees ten thousand five hundred only) per month w.e.f.02.06.2018. The amount sanctioned in para-5 above shall be debited to the Head of Account 2053 - District Administration, MH (094) – other Establishment, SH (06)-310/312 – other Grants-in Aid, instead of Head of Account 2053-094- SH(06) -010 salaries. AP Village Revenue Assistants VRA Salary hike GO 303 download. AP Village Revenue Assistants Salary Enhanced GO-VRA's Honorarium Increased Order here.